As the people of Hooting into the Abyss know, I like robot based games as much as some people like Skaven, the richness of Malifaux or sleeving cards. It was thus probably inevitable I would try this one at some point. What caught my eye was the card in the picture above - it's illustrated by the fairly renowned animator and designer Masami Obari, who I'm quite a fan of. Buying a game based on one illustrator being involved seems a really bad idea, but buoyed by terrible influence from some other friends I nevertheless did so. To begin with an overview. Vanguard is a collectible card game in the vein of Magic, rather than a Living Card Game like Game of Thrones or Netrunner. Trying to build a deck via booster packs is supremely inadvisable because unlike Magic's blocks and sets (groups of cards that are themed together but are interchangeable - you can use Ravnica cards in a deck with Innistrad ones and all the game worries about is usually the colour), Vanguard divides cards that form parts of combos and refer to each other haphazardly between sets. Indeed, Magic tries to somewhat avoid having set theme intrude on design after sets like Kamigawa proved less easily integrated into decks made using a wider card pool. As a result the best way to play is buy two premade decks and use them. That way everyone is on an even footing and you save a lot of money and time, because Vanguard is a very theme and combo driven game. Two-colour decks aren't a thing, really - taking out of faction cards can actively penalise you. On to the rules. I mentioned above this is a game based around combos, and this is made clearest in how creatures work. Each player begins the game with one Vanguard, a bit like an Identity in Netrunner or your Commander in a game of Magic EDH. Your Vanguard determines what cards you can play - all cards have a level, and you can never play a higher level card than your Vanguard. It is effectively a resource curve without the need for specific resource cards taking deck space - a player's turn begins with a step where they may level up if able, and some decks can "ramp" by using card abilities to get a second such step. While rushing to top level seems the obvious strategy, playing more slowly is a possibility - each card used to level up enters a stock called the "soul" which is its own resource pool. Paid abilities either mill cards from deck to soul or soul to discard pile - again using cards as a generic resource to avoid resource distribution problems. Once the level up step is done, a player may play creatures. These have no costs save the level restriction, but you may only have five in play at once and only two of those can actually attack. Creatures are either in the front or back row, RPG style, and back row creatures may not attack. Instead, they have abilities to assist - either adding their value to an attack by "resting" (tapping by any other name) or being sacrificed from play or hand to block. That cards always sacrifice to block adds a resource management aspect which is interesting in practice - if the cost of stopping damage is the loss of a usually good creature from hand, there are no real "chaff" cards like 0/1 tokens or 1/1 creatures. Attacks are either directed at the opposing Vanguard or opposing creatures - the former is the way to win while the latter disrupts the opponent. The victory condition is to deal six hits to the opposing Vanguard by dealing enough damage to beat its toughness and all blocking creatures. If an attack on a vanguard is successful, the defender discards one card from his deck to his damage stack. If it has a relevant ability it triggers. 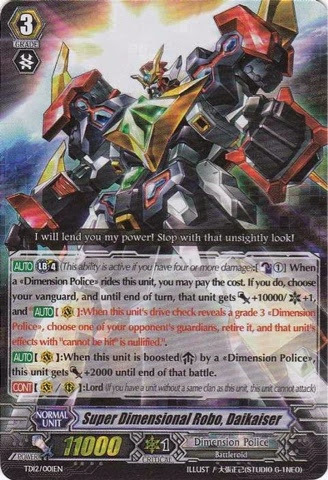 If a vanguard attacks, there is a slight twist - the attacker draws a card to see if it has a triggered ability on it, and if it does, then they gain bonuses such as "standing" (untapping) a creature or causing bonus damage. These core mechanics - limited creatures, supporting cards and levelling up - are the majority of the game. The real interest comes in how card abilities use this design space thematically. For example, a dragon-themed card might discard "soul" cards to attack multiple enemy creatures, or the robot deck I use is focused on combining abilities of low levelled creatures to level up more quickly. Here the third resource enters play - damage. Some paid abilities require the player to have sustained an amount of damage and require the tapping of cards in the damage stack to pay costs. It is not quite like Magic's graveyard strategies like Dredge or Threshold, but those aren't a bad analogy. All in all, Vanguard is a much more interesting game than it might seem - while it is hard to review any creature fighting card game without the spectre of Magic overshadowing it, Vanguard's resourceless system and mill/draw/damage as currency is innovative and appealing. On the other hand it has issues - the card design, with huge art and tiny text, can be very obtrusive. Furthermore actually trying to construct decks using its haphazard rarity and set distribution is a frustrating exercise (although the premade decks are very well designed and worth using). All in all I feel its deck building aspect of factions and levels would have suited the LCG model well, and it is weakened by the random purchase format.